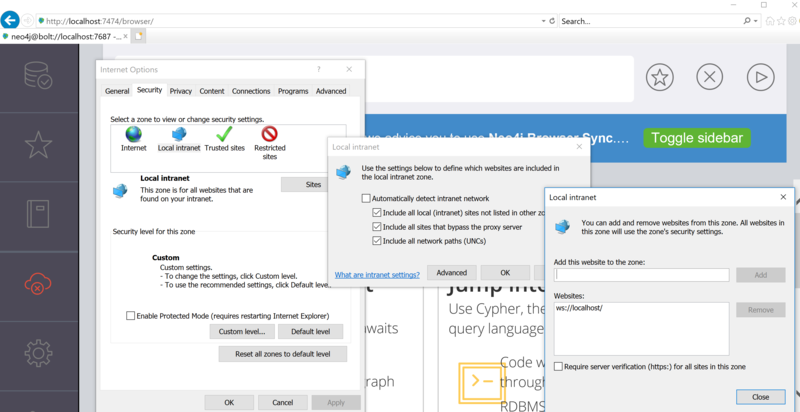 As the Neo4j Browser is using websockets to connect , for example ws://localhost, you would need to add ws:\\localhost\ to Internet Explorer configurations ( Internet Options / Security / Local Intranet / Sites / Advanced) and as depicted. To access the Internet Explorer configuration click the gears icon in the upper right corner of the browser. I uses IE11 and added ws:\\localhost\ to Internet Explorer configurations ( Internet Options / Security / Local Intranet / Sites / Advanced). And I restarted neo4j and IE several times, the “Security Error: 18” kept occurring…how can I do?? ?